Two Little Hands Training Center is a group of professional CPR Instructors, Emergency Medical Technicians, Paramedics, and Firefighters who will come to the comfort of your home or work place and teach you how to act quickly, decisively, and professionally to any emergency until professional help arrives. Let us teach you FIRST AID, CPR, and AED. Classes can be taught in English and Spanish according to American Red Cross and American Heart Association. Two Little Hands Training Center was created by Sasha Gomez, who at the age of just 14 sat and watched, like everyone else around him a 6 month old infant die, cause no one knew how to help. What if he could have helped by doing CPR until trained Medical Professional arrived? What would you have done if the same situation happened to you? Our staff will prepare you with American Red Cross or American Heart Association Heartsaver® preparedness programs in FIRST AID, CPR and AED. Courses are available for any age and can be tailored to the needs of specific groups and individuals. Whether you work with children, want training for employees, are a professional rescuer, or simply want to know how to help someone in an emergency, we have a program for you. Classes can be taught in Spanish. For your convenience, classes can be scheduled at your facility, home, school, daycare, community center, anywhere at a time that works for you-daytime, evenings and weekends. 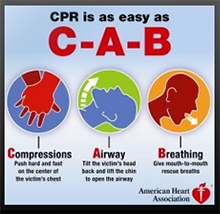 The American Heart Association (AHA) today issued new guidelines for cardiopulmonary resuscitation, better known as CPR, making rapid chest compressions the mainstay of basic life support for bystanders trying to revive people whose hearts have stopped. Sign up today and learn the basics of Hands-Only CPR. With nearly 15 years of experienced Instructors, Two Little Hands Training Center first aid, CPR and AED programs are designed to give you the confidence to respond in an emergency with skills that can save a life. American Red Cross and American Heart Association Heartsaver® courses incorporate the latest science for first aid, CPR and emergency cardiovascular care, meet OSHA's Guidelines for First Aid and bring you a wealth of educational innovations. Two Little Hands Centro De Entrenamiento es un grupo de instructores profesionales del RCP que van a la comodidad de su casa o lugar de trabajo y les enseñan actuar rápidamente, decisivamente, y profesionalmente en cualquier emergencia hasta que llegue ayuda profesional. Le enseñamos los PRIMEROS AUXILIOS, el RCP y el DEA. Las clases se pueden enseñar en inglés y en español según la Cruz Roja Americana y American Heart Association.